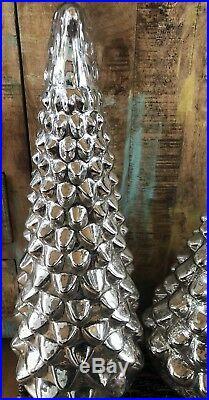 New in box Set of 3 Pottery Barn 1 Large, 1 Medium, and 1 Small, LIT MERCURY GLASS TREES. Create a display of wintry light and shadows with these silver mercury-glass trees. Their mottled antiqued surfaces beautifully reflect lights that decorate them. Hollow glass tree is blown glass with a mercury glass finish on its interior. Hole on the underside for placement of the lights. For indoor use only. Small: 7″ diameter, 9″. Medium: 9.5″ diameter, 17.5″. Large: 9.5″ diameter, 22″ high. Wipe with a soft, dry cloth. Do not exceed specified lighting recommendation above. 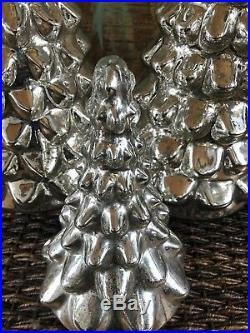 The item “Pottery Barn LARGE Medium Small LIT MERCURY GLASS TREE Set Of 3 Christmas Decor” is in sale since Monday, December 3, 2018. 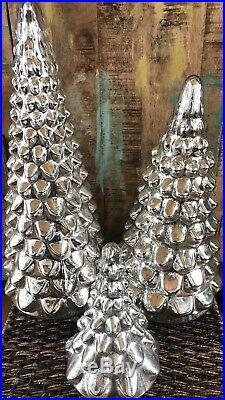 This item is in the category “Home & Garden\Holiday & Seasonal Décor\Christmas & Winter\Other Christmas & Winter Décor”. The seller is “sun3804″ and is located in Savage, Minnesota. This item can be shipped to United States, Canada, United Kingdom, Denmark, Romania, Slovakia, Bulgaria, Czech republic, Finland, Hungary, Latvia, Lithuania, Malta, Estonia, Australia, Greece, Portugal, Cyprus, Slovenia, Japan, China, Sweden, South Korea, Indonesia, Taiwan, South africa, Thailand, Belgium, France, Hong Kong, Ireland, Netherlands, Poland, Spain, Italy, Germany, Austria, Bahamas, Israel, Mexico, New Zealand, Philippines, Singapore, Switzerland, Norway, Saudi arabia, Ukraine, United arab emirates, Qatar, Kuwait, Bahrain, Croatia, Malaysia, Brazil, Chile, Colombia, Costa rica, Panama, Trinidad and tobago, Guatemala, Honduras, Jamaica, Viet nam. This entry was posted in pottery and tagged barn, christmas, decor, glass, large, medium, mercury, pottery, small, tree. Bookmark the permalink.